Fast-moving fire fueled by dry brush shows flames over 30 feet high in Buffalo Grove just after 1:10 p.m. Sunday [PHOTO CREDIT: Emanuel Krakauer]. See more than 300 photos on Facebook.com/CardinalEmergencies. Buffalo Grove police have arrested and charged Gabriel R. Horwich, 20, with criminal damage to property by reckless means of fire. Three others — possibly juveniles — have not yet been charged as the incident is investigated. An off-duty Morton Grove police officer detained at least two of four subjects that were discovered running from the fire, just before 1:06 p.m. Sunday. Police report the group possessed illegal fireworks and are suspected of igniting a fire that quickly spread and threatened about 20 homes nearby. At age 17 Horwich was arrested in November 2008 and charged with four felony counts of burglary and three counts of criminal damage to vehicle after several vehicles were burglarized in his own neighborhood. He was charged with two other teens, who were discovered after a car alarm was activated about 3:30 am. Tuesday, November 4, 2008. In March 2009 in Lake County Circuit Court, Assistant State’s Attorney Stephen Scheller agreed to reduce the charges against Horwich in exchange for his guilty plea — $829 in restitution and 75 hours of public service. 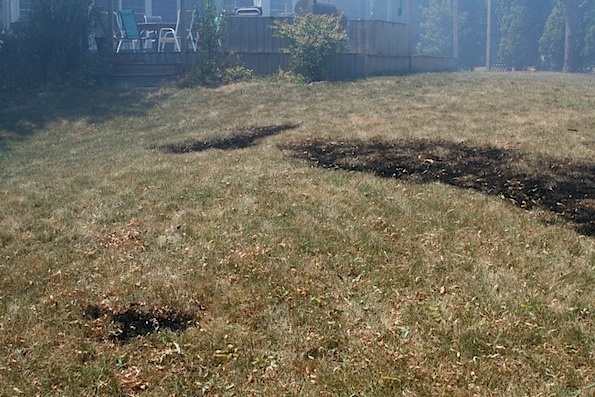 Buffalo Grove police and firefighters responded about 1:06 p.m. Sunday to a report of a field fire near the 400 block of Cedar Court South. Emergency responders received a report that a small brush was caused by two juveniles setting off firecrackers, and that an off-duty police officer had the two juveniles in custody at the intersection of Brandywyn and Cedar Court South. The fire grew quickly with flames as high as 30 feet or more. 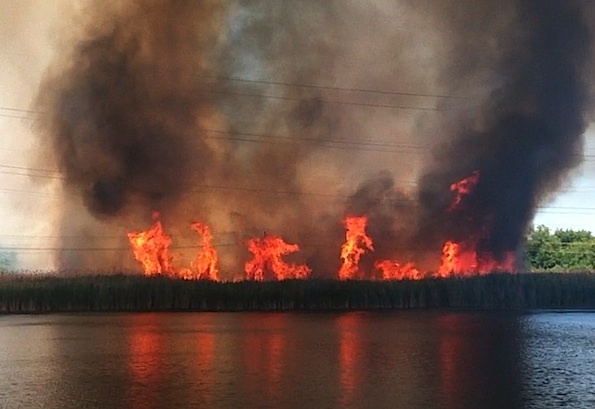 The fire also spread rapidly toward the west with winds reported at about 15 mph to 18 mph from the northeast and from the north-northeast direction. Winds were also gusting as high as 26 mph during the fire. 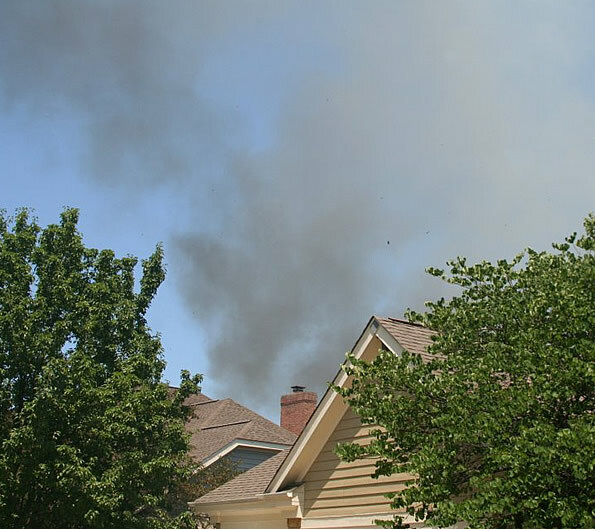 Smoke rises and ash falls over houses and residential properties near a major brush fire in Buffalo Grove. The black flecks in the photo show large flakes of ash from burnt vegetation that rained down on neighborhoods (See over 300 photos on Facebook.com/ArlingtonCardinal). The flames were frightening for residents that lived near the fire, as they watched a wall of fire edge toward their homes. Homes were definitely threatened by this brush fire, police evacuated about 25 homes. Fire command quickly called for a second alarm, which eventually brought firefighters from Arlington Heights, Barrington, Countryside, Deerfield-Bannockburn, Palatine, Palatine Rural, Prospect Heights, Grayslake, Highland Park, Highwood, Lake Bluff, Lake Forest, Lake Zurich, Lincolnshire-Riverwoods, Long Grove, Mundelein, Wheeling and other communities to assist Buffalo Grove firefighters. Firefighters extinguish flames at the rear property line of residences just south of the brush fire (See over 300 photos on Facebook.com/ArlingtonCardinal). Firefighters wet down the roofs and decks of homes near the fire, and also wet down the dry vegetation to the west of the fire. Several utility poles caught fire, which caused arcing wires. A widespread power outage also occurred in the neighborhoods nearby. The area is also covered by high tension power lines. About $150,000 is reported to have occurred to ComEd property — power wires and utility poles. Firefighter operations for a threatening brush fire, especially on the West Division of the fire, near Brandywyn (See over 300 photos on Facebook.com/CardinalEmergencies). 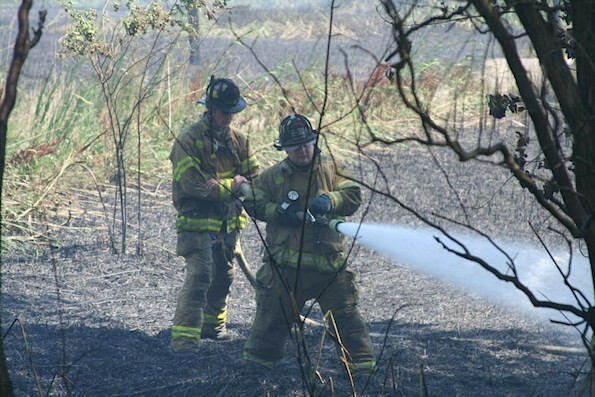 Small fires continued to burn Sunday evening, and firefighters were called to a grass fire that rekindled as late as 7:25 p.m. Sunday near the 500 block of Coventry Lane. Photo shows how close the fire came to igniting a rear patio deck of a Buffalo Grove home Sunday (See over 300 photos on Facebook.com/CardinalEmergencies).